I thought work would leave me more time, but I’m still crunching at the office. I haven’t had time to work on this much. But it’s still slowly progressing…! With work and me moving to my new house, work on the Castle Of Illvision had stopped completely, now I’m getting my groove and daily regular life back, so I’ve resumed work on the game this week! I had to deal with going up/down stairs which didn’t work perfectly with how I had planned my coordinates system, but now that’s all fine and good. 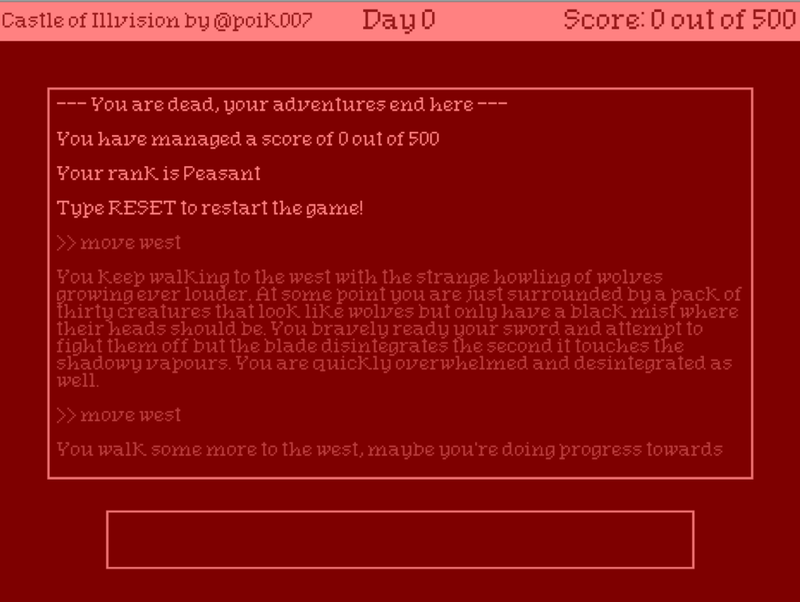 I’m realizing that creating a text-based adventure game is way more work than it looks like! GACHA HELL is on hiatus. The core idea of the game is still there and still interesting to me; Fight a bunch of monsters with a weird team of characters with tons of gear and skills to use in order to get currencies to feed into a gacha in an endless cycle of rinsing and repeating. I don’t think that my implementation that I had was fun enough and the content creation pipeline was a nightmare. I would have to retool significant parts of the game flow and the way I create all of these enemies/maps/skills/etc, which would mean doing a bunch of boring tech busywork for a good while. So instead, welcome to Castle Of Illvision, my new project for now! It’s going to be a text-parser based adventure game where a brave knight rides on to the Castle to find their friend that disappeared there. 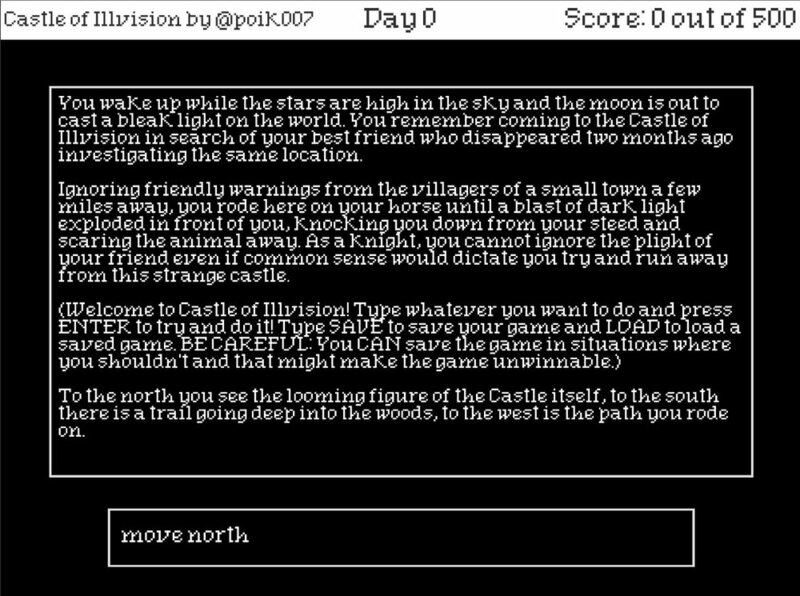 Full of puzzles and pitfalls, Castle Of Illvision will probably come out this year or at the beginning of next year. I’m so busy. Currently working on: Area outside the castle. I’m almost really done for real this time! I have two endings out of three completed but the last one will take a bit more time. I really want to finish before Awesome Games Done Quick start this Sunday, so that’s my goal right now. I’m still wondering if I want to add sound effects or if it’ll work without them (it probably is fine) but that would be a nice to have! I am almost -almost- done with Talk || Take. I just completed the last dungeon with its three mini-bosses and now I have to do the final fight which changes depending on your alignment. I also need to do the ending sequence, but then it’s simply a matter of adding audio, playtesting as needed (hah) and releasing! I’m done with the shield sidequest, so now I started working on the Sword one, which will take a bit of time since I have to basically replay most of the game in order to gather all the Lightium Ore. It’s an interesting way to go about it because you don’t start with the fairly powerful Great Sword and need to plink away at dungeons and the overworld for a while armed with nothing but a pickaxe. I’m finding bugs here and there and stuff I need to re-design but otherwise I’m still having a blast working on this! Today I finished the evil sidequests of the game; Notably the acquisition of the Darkness Sword and the Blood Shield, I also made the functionality of using those together. Now I’m working on other stuff, like the way you can get better ‘good’ shields. I have a few more things left to do, but the game is coming along nicely! Almost one hundred hours too! Didn’t have much time to work on the game these days because of crunch at work, but I kept plinking away at the Vile Wizard sidequest. You’ll need to do some bad stuff to get there, but the rewards are okay? I’m almost done with making the Darkness Sword stuff work, then I have the Blood Shield to do. Afterwards I’ll work on the main Sword questline and finish the ‘Good’ shield one as well. Still working on sidequests! I don’t have that many left to do - although the remaining ones are the ones that will be the most time-consuming - but I’ve completed the Bomb Sidequest today. I still have to do the Staff, Sword and Shield ones, then I’ll tackle Castle Blackmoor! Today I almost completed the Bracelets sidequests and the addition of ThiefThief into the game. In order to get Bracelets, you have to go talk to Pilf The Sneak and he will challenge you to a treasure winning game. You can play the game and win them and you’ll need to pay and win 3 of them to get the strongest one. Or you can just steal the bracelet! 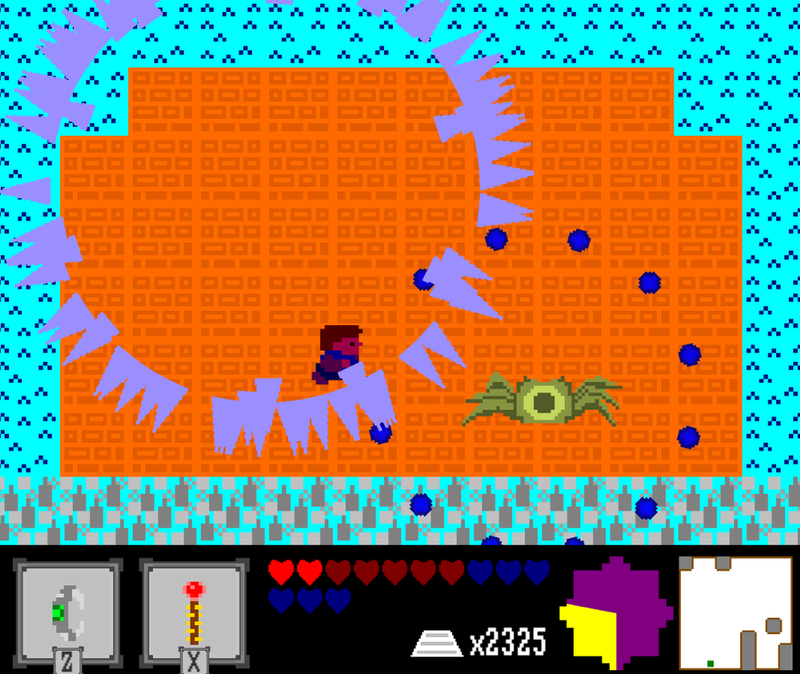 In this case, ThiefThief, Pilf’s Reepuvian Worm will come after you for the rest of the game and it will try to steal the money enemies drop. He’s not super fast, but it’ll add up! Almost done with the ancient battlefield! I only have one enemy left and then I’ll be able to tackle Castle Blackmoore and a few of the side quests. Currently working on: Almost done with the ancient battlefield! After a while spent working on my PROCJAM 2018 entry and a small break, I’m resuming work on Talk || Take with the second to last dungeon, the Ancient Battlefield. 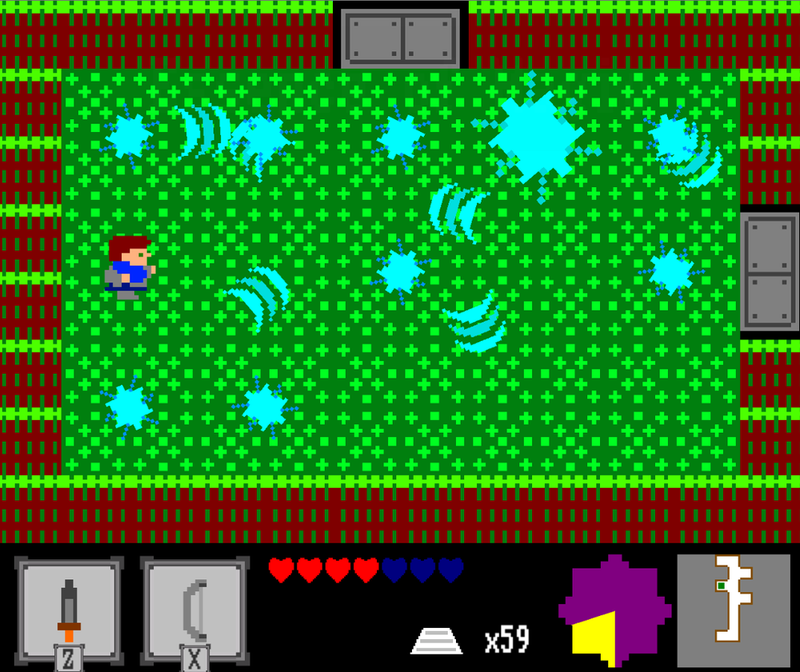 Enemies here include automated statues that shoot at the player and dangerous bomb droppers. This shouldn’t take too long because I already have the basic layout of the dungeon and the enemy concepts! Another one dungeon completed! I’m currently working on the magic staff mechanics before starting dungeon 4/7. Here’s a bit more of the encyclopedia! Still working on The Magic Grove, almost done in fact. I only have one boss fight left to code and then I’ll move to another dungeon. Probably the graveyard one! I’ve been working on the ‘third’ dungeon lately, The Magic Grove, it’s a forest themed dungeon with snakes, spiders and magic crystals. There are a bunch of other things to do in the sidelines, like sidequests and alternative paths you can take through the game, but I reckon I’ll work on that when I’m done with all the dungeons. The world map is ‘done’! 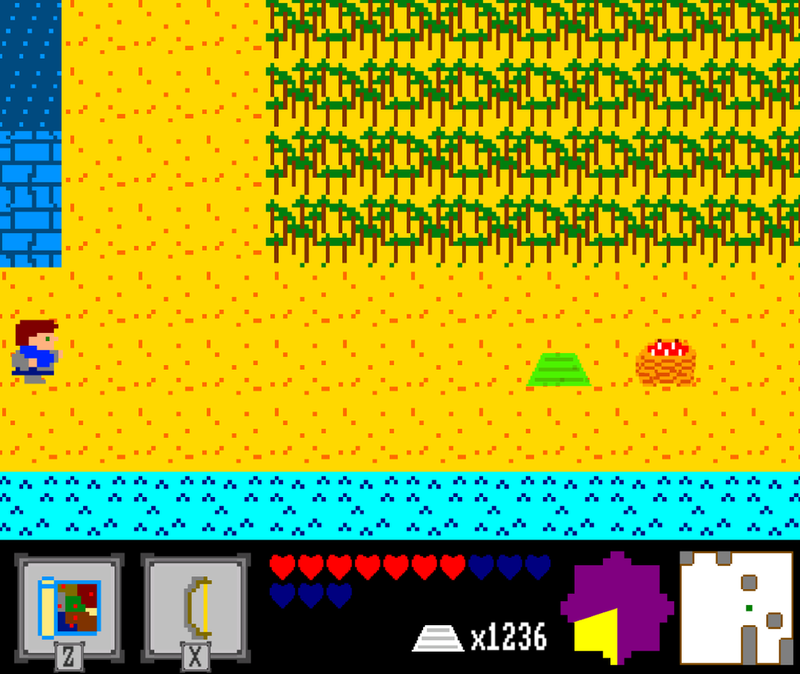 And by that I mean that all the tiles are there, enemy spawns are placed and entrances are also there. I still need to work a bunch of side quests and item mechanics and the dungeons are still a WIP. But hey, the world map is done that’s something! I've worked on the Blood Plains a bit in the last few days; Adding the Ancient Cannon that you can move around and set to fire at will on the two factions warring over this region. You have to do this in order to unlock the Ancient Battlefield, which is where the Seal of War is located.